I’m starting the year off by trying to keep up with some challenges I enjoy! Color Stories Inspiration is my favorite! There are so many talented ladies in this group. I love being a part. I chose from the Evidence to use string, banners; different color letter stickers; and leaves as the 3 clues for my layout. 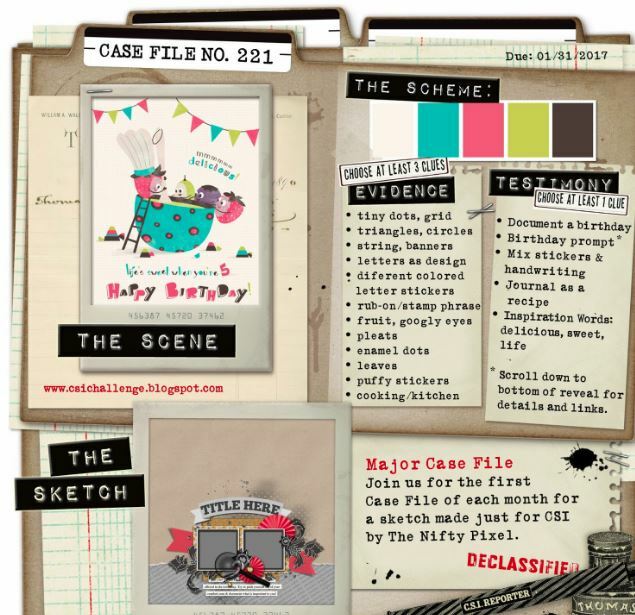 For the Testimony I documented a birthday…my son’s birthday! I loved making this layout! It reminded me of the many cakes I made for my son. I always tried to make a different one each year. I was definitely not a expert cake decorator by any means, but I did enjoy it. What got me started was the fact that my son had an allergy to milk. Pretty much all of the cakes that are store bought have milk in them. So I had to make his. He so appreciated them! He was excited every year to see what I created. I love the bright colors in this layout. And I’m in love with the cluster I made at the top right corner! I would love to hear your comments. And if you get a chance, you should try a challenge at CSI. And before I forget….CSI is celebrating their 5th Birthday!!! So lets give a big shout out to them….Happy Birthday CSI! 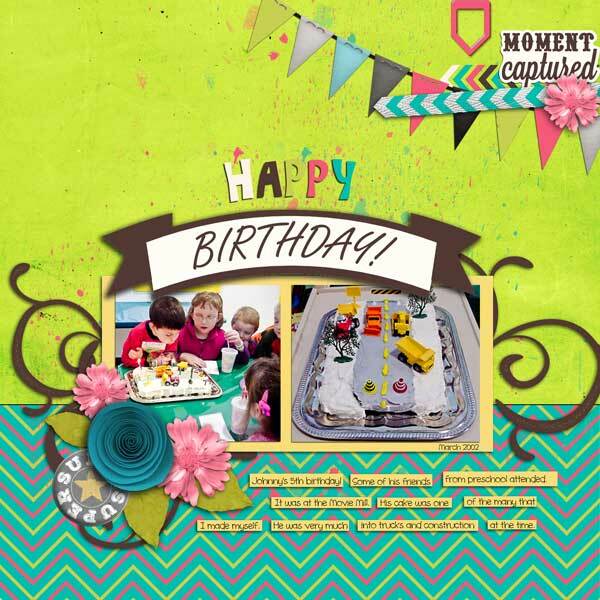 Super fun and festive page–so perfect for birthday photos! So happy to have you playing with us at CSI! I love CSI! Hope to play more often! Thank you so much! It was such fun to work on!